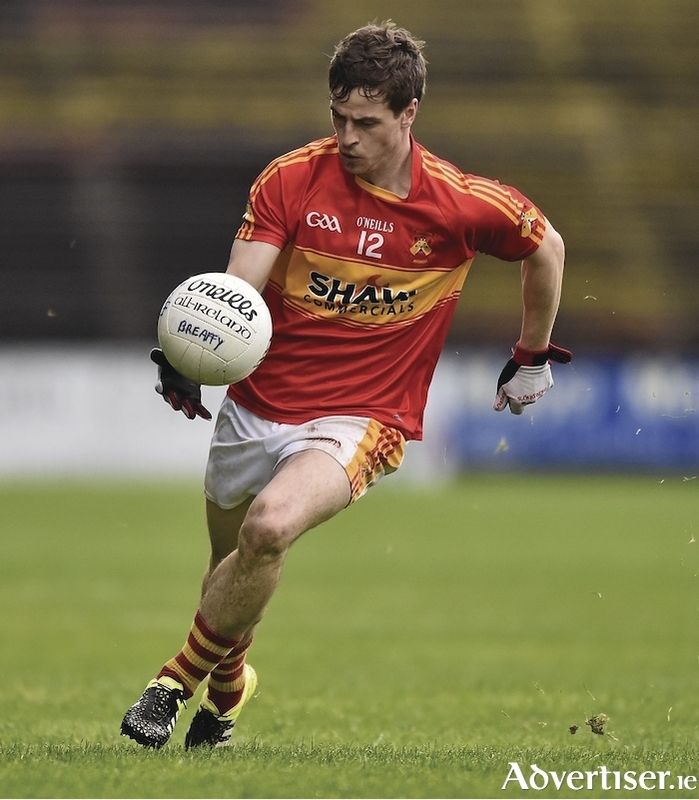 The battle to topple Neil Douglas and his Castlebar Mitchels teammates will resume this weekend when the ball throws in on round two of the Mayo GAA Senior Football Championship. Photo: Sportsfile. After a four-and-half month hiatus the Mayo GAA Senior Football Championship will spring back into life this weekend with eight round two games down for decision. After the first round of group games Castlebar Mitchels and Ballaghaderreen lead the way in group one, in group two Garrymore and Charlestown picked up wins first time out, Westport and Claremorris were victors in the opening games of group three and in the final group Breaffy and Ballintubber are standing tall ahead of the resumption of action tomorrow afternoon. Defending champions Castlebar Mitchels will look to wrap up their spot in the last eight tomorrow afternoon when they travel to east Mayo to take on a Aghamore side who were beaten by Ballaghaderreen in round one. The county town men are also currently sitting on top of division one in the league with six wins from their nine games. Mitchels have been out in front of the pack for the past number of years and it looks like they will be hard stopped again, with the likes of Paddy Durcan, James Durcan, Neil Douglas, Danny Kirby and Donal Vaughan in their ranks so it will be a serious task for Aghamore to take down the Castlebar men. The hosts will be looking for big games from the likes of Alan Freeman, Ross Egan and Fergal Boland to drive them on, but it is doubtful they will be able to pick up the points in this one. When teams met in the league back in May, Mitchels ran out 1-16 to 0-10 winners. The second game in that group will see Ballaghadreen travel to the north Mayo capital to take on Ballina Stephenites on Sunday afternoon. Ballagh' are operating in the second division in the league and are currently sitting top of the table with seven wins from their nine games. While Ballina are plying their trade in the top division of the league, but it does not mean that they will be hot favourities for this one. They are though coming into this one on the back of a massive 3-22 to 0-8 win last weekend against Crossmolina Deel Rovers and will fancy their chances of picking up a win at home against their visitors. The big game in group two is the meeting between Garrymore and Charlestown on Saturday evening in south Mayo, both sides picked up wins in round one with Garrymore seeing off senior new boys in round one and Charlestown seeing off Knockmore at home. The teams have met two times already this season with Garrymore picking up the two points from their league meeting back in April and Charlestown claiming the Michael Walsh league title when the duo met in the final of that competition back in Kiltimagh a few weeks ago. Garry' last year went all the way to the semi-final and it took Castlebar Mitchels a replay to see them off and they have some serious championship experience in recent years and having home advantage against it will be a major advantage heading into this one. In the league Garrymore are also flying high sitting in joint second place with six wins from their nine games, while Charlestown are languishing in the relegation danger zone at present with just two league wins all season and getting well beaten by Breaffy last weekend. The meeting of Knockmore and Moy Davitts on Saturday afternoon is the most local of local derbies and this should be a fiery encounter, where last years intermediate champions Moy Davitts will be looking to get on over their more illustrious near neighbours on their own patch. Knockmore are doing well in the league, just three points behind league leaders Castlebar Mitchels with five wins from their nine games and come into this one having beaten Ballintubber in their last league outing. The visitors are plying their trade in division two in the league and are sitting in fifth place and looking out of the promotion race between with five wins so far in that competition. A lot of eyes will be focused on the goings on in St Patrick's Park in Westport when the Covies' host Hollymount-Carramore. The seasiders are seeing the fruition of a lot of good underage work being done in recent years. They are flying in the league sitting joint top of division two with 14 points from their nine games and last weekend had a 3-20 to 2-10 win over Islandeady. It has been a difficult year for Hollymount-Carramore on and off the field this year and they will do very well to pick up a victory against their hosts on Saturday evening. Claremorris are another side that look like they might be seeing pay-off from some good underage success in recent years, last year they surprised everyone seeing off Breaffy in the quarter-finals of the competition and they picked up a good win in round one over Hollymount-Carramore. On Saturday they will expect to pick up another win when they host a Crossmolina Deel Rovers side who are a long way off their historic highs. They look to be heading to division two in the league having lost every one of their nine league games to date and last weekend being soundly beaten by Ballina Stephenites. Group four has one of the most anticipated games of the weekend when two sides who will fancy their chances of a having a crack at taking the Mitchels title meet in Clogher when Ballintubber host Breaffy. Both sides picked up wins in round one and while Breaffy are having the better league season with six wins from their nine games, compared to Ballintubber's three league wins - but that will count for very little when these two go toe-to-toe on Saturday evening. When the teams met in the league in March, Breaffy won by two points; at home things will be expected to be just as tight again in this one when the full time whistle goes. The remaining game in the championship is the meeting of Davitts and Kiltane in Bangor Erris where a win will give either side hope of making it to the last eight and also give them a very good chance of avoiding the relegation dog fight when all is said and done at the end of the group stages. Both teams are playing in division two in the league and the north Mayo men are sitting pretty just one point behind the joint league leaders Ballaghaderreen and Westport; While for the south Mayo men the league season has been a struggle and they currently sit second from bottom with just on league victory to their name so far this year. When these two met in the league it was a thriller where the north Mayo men came out on top on a score of 1-14 to 1-13 back in March. Ballintubber v Breaffy; Saturday August 25 at 6pm. Page generated in 0.0735 seconds.